Media outlets - private TV stations in particular - have mushroomed in the post-Taliban years. Radio, the main source of entertainment and news, is losing audiences to TV. The broadcasting market is crowded with three dozen TV channels broadcasting terrestrially from Kabul alone. Over 170 FM radio stations operate across the country. Some 61 per cent of households own a TV set. Hundreds of press titles publish under a wide range of ownerships - from the government, provincial political-military powers and private owners to foreign and NGO sponsors. Private Moby Group operates some leading stations, including Tolo (Sunrise) TV and Arman FM. Much of the output on private TVs consists of imported Turkish and Indian music shows and serials, and programmes modelled on Western formats. Tolo TV is the most popular national station. Journalists continue to face violence, threats and intimidation by the Taliban, officials and powerful people. The Taliban killed seven employees of Moby Group in a suicide attack in January 2016 for broadcasting alleged anti-Taliban and anti-Islam propaganda. Laws ban material that is deemed to be against Islamic law and some private stations have angered religious conservatives. TV stations self-censor, and often partially-pixelate images of women. Foreign-based or foreign-funded radios broadcast in Kabul, including the BBC (89 FM), Radio France Internationale, Deutsche Welle and US-backed networks Radio Free Afghanistan (broadcasting as Azadi Radio) and the Voice of America, which brands in Dari and Pashto as Radio Ashna ("Friend"). BBC World Service is available on FM in other major cities, and on shortwave across Afghanistan. 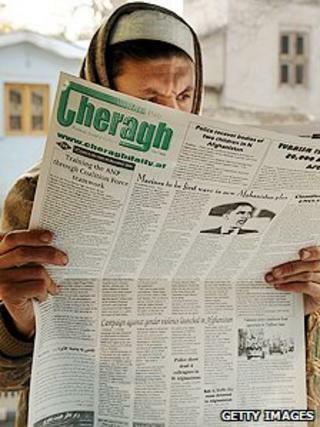 Newspaper readership has seen a significant leap, from almost nil under Taliban rule. Newspapers tend to reflect more openly on domestic developments than do broadcasters. Some 27 per cent of households have at least patchy access to the internet and computer literacy and ownership rates are low. Facebook is used by some younger Afghans and the political elite. But limited and expensive internet access acts as a brake on social media use.